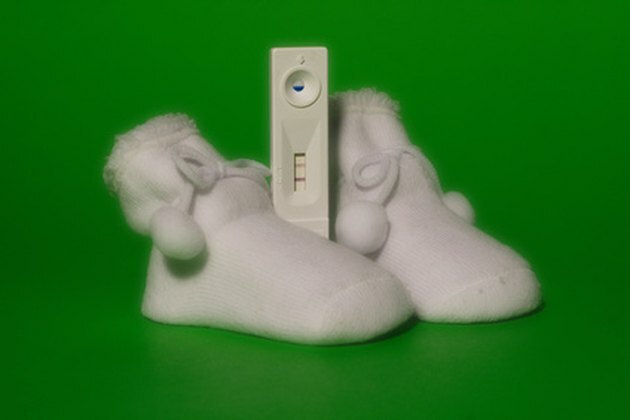 False positive results are uncommon on pregnancy tests; false negatives are much more common. Certain medications can cause a false positive result on blood test or home pregnancy tests. Pregnancy tests measure levels of human chorionic gonadotropin (hCG) in the blood or urine. Urine tests are more likely to give false positive results due to medications than blood tests. The drug most likely to cause a false positive reading on a pregnancy test is hCG, which is given to women undergoing fertility treatment to mature and release an egg from the ovary. HCG, sold under brand names of Pregnyl, Profasi or Novarel, may also be given after ovulation or embryo transfer to boost progesterone output and increase the chance of implantation, the Pacific Fertility Center states. Some women also take hCG to help them lose weight. Because hCG is the hormone tested by pregnancy test, taking the drug will yield a false positive result in both blood and urine. It takes around 7 to 14 days to clear the drug from your system after injection. Fertility Plus recommends waiting 7 days after a 2,500 International Unit (IU) injection, 10 days after a 5,000 IU injection, and 14 days after a 10,000 IU injection to test. A number of different types of psychiatric medications can cause false positives on urine tests. Librium (chlordiazepoxide), an anti-anxiety medication also used to control agitation during alcohol withdrawal, can cause false positive pregnancy results in urine pregnancy tests, Medline Plus states, but blood tests will not show false positive results. Phenothiazines and phenothiazine derivatives are antipsychotic medications used to treat psychiatric disorders that can also give false positive results on urine pregnancy tests. Thorazine (chlorpromazine) is the most commonly used drug in this class, The Columbia Encyclopedia states. Several other medications can cause false positive urine results. Diuretics, medications that reduce the amount of fluid in the body, can sometimes cause a false positive pregnancy result on a urine test, according to the Mayo Clinic. Phenergan, a medication used to treat nausea and allergic reactions, can also give false positive results. Methadone, given to treat heroin addiction, can cause a false positive result on urine pregnancy tests, Cigna states. Follow up with a blood test will give more accurate results. Mayo Clinic: Home Pregnancy Tests: Can You Trust the Results?